Julia Krajewski and Chipmunk FRH. Germany’s Julia Krajewski produced a staggering performance in the North Carolina sunshine as Mars, Inc. Eventing began at the FEI World Equestrian Games™ 2018 Tryon on Thursday. 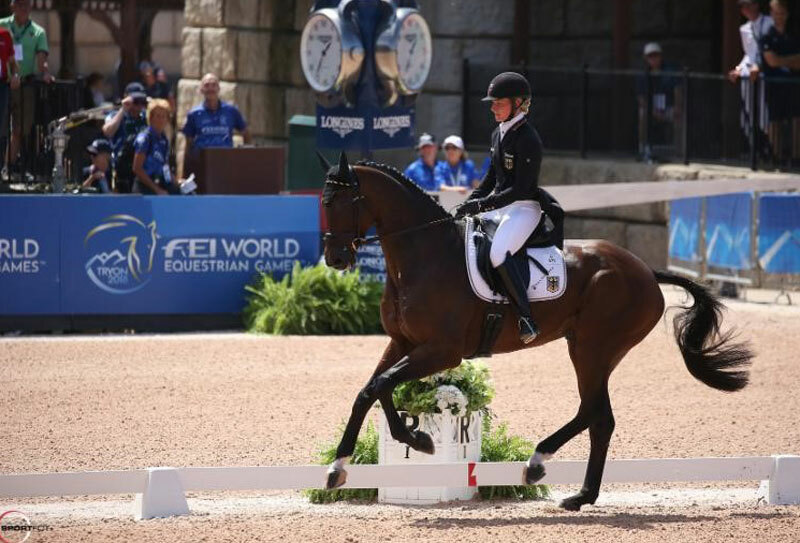 Krajewski, a renowned superstar performer in the dressage phase with Chipmunk FRH, did not disappoint the electric atmosphere in Tryon Stadium that lapped up every moment of what at times looked like an exhibition performance. The rider herself admitted she was close to tears, such was the horse’s brilliance in scoring just 19.9 penalties, as defending champions Germany made an immediate statement of intent in their quest to capture the Mars, Inc. Eventing crown. There were some strong dressage displays on day one of the competition, with the likes of USA’s Boyd Martin, Great Britain’s Piggy French, Australian Christopher Burton and France’s Donatien Schuly all posting sub-30 scores. But, the German was in a different league, and she said, “Maybe something really good was going to happen today and he felt awesome during the test. “He has done good dressage tests before, but to produce it in such an atmosphere on this day, the people went crazy. “It is not a personal best – he has had scores of 19 something before – but it is not just push a button and get 19. With a horse like him that can really do it, it is all about the detail. Boyd Martin rose to the challenge impressively on home soil with Tsetserleg to post a 27.1 score and lie second overnight, just ahead of Piggy French and Quarrycrest Echo on 27.8. French led the British challenge on day one as they bid to reclaim a title won impressively in Kentucky eight years ago. Eventing icons Blyth Tait and Andrew Hoy, meanwhile, showed they had lost none of their world-class quality by holding top 10 placings overnight after New Zealander Tait – twice an Eventing World Champion – and Australian Hoy, a three-time Olympic Gold medalist, shone on Dassett Courage and Vassily de Lassos, respectively. Remaining Team and Individual riders enter the arena for day two of dressage on Friday, September 14, before attention turns to the second phase of Cross-Country on the White Oak Course at TIEC on Saturday, September 15.